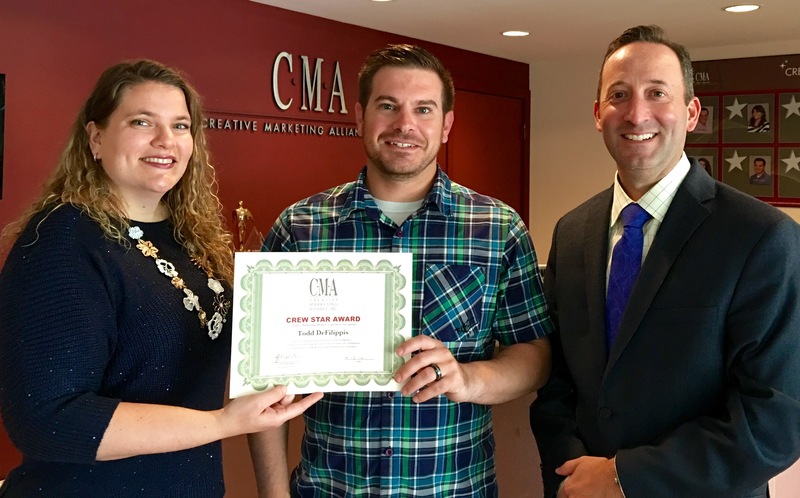 PRINCETON JUNCTION, N.J. – June 9, 2016 – Senior Staff Accountant Todd DeFilippis has been named Crew Star for the second quarter at Creative Marketing Alliance (CMA), a full-service, award winning marketing firm located in Princeton Junction. Victoria Hurley-Schubert, public relations and social media specialist and first quarter Crew Star (left) and Christian Amato, COO (right) present Todd DeFilippis, senior accountant (center) the Crew Star award for the second quarter. The quarterly Crew Star award recognizes a team member each quarter for his or her dedication to the company’s core values and instilling these positive principles to the team, while also enhancing the company’s culture. At CMA, which was named 2016 Outstanding Small Business of the Year by the MIDJersey Chamber of Commerce, DeFilippis works with staff members and clients to ensure accurate financial reporting. He graduated from University of North Carolina at Wilmington with a degree in accounting and earned his M.S. in accounting from Fairleigh Dickinson University. With this award, DeFilippis will receive a reserved parking spot in the employee lot, lunch with CMA’s executive team, a gift certificate to a local restaurant and his headshot will be prominently displayed in the CMA lobby along with past Crew Star winners. For more information, visit CMAresults.com.